We have 16 sites with electricity and water at each site most are fully shaded. There is a dump station midway down the drive to the RV Park. All sites are $25/night which includes use of the dump station and have 20, 30 & 50 amp hook-ups. Dry camping is $6 per night (the dry camp fee does not include use of the dump station). We now have WIFI available in the RV Park, Picnic Area and Lodge at no charge. 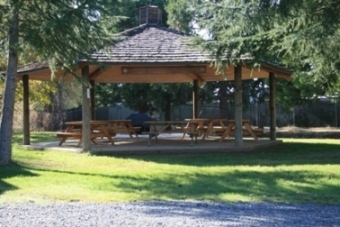 The RV Park has a small gazebo with 6 picnic tables and a barbeque for guest use at no fee. In addition to the gazebo there is a large pavilion available for larger groups. Bidwell Park is located just 1 mile away. It has two swimming holes one with life guards in the summer and an 18 hole golf course. Chico is home to California State University, Butte Community College, and Sierra Nevada Brewery. We also have a little league park alongside our RV park. Chico has a Thursday night market (April thru October), Friday night concerts in the park and a Saturday Farmers Market (year round) all are located in our downtown just 5 miles away. Our Lodge serves dinner, Tuesday, Wednesday, and Thursday nightsFriday nights bring live bands and small plates for dinner and our bar is open 7 days a week. The main pavilion which has several large BAR B Qs is available for rent to larger groups. Located in the RV Park and available for your use at no additional charge. It is located just south of the larger Picnic Pavilion. We also have several horseshoe pits available when the pavilion is not rented out. Lounge is open daily at 2:00 pm Saturday and Sunday 9:00 am We have four large screen televisions. Free popcorn and peanuts. Hot Dogs & Chips available on Saturday & Sunday. NASCAR and sporting events on the weekends. Stop in and unwind with a cocktail after getting settled into our RV park. The Chico Elks Lodge has Chico's largest full-service event venue, banquet and conference center, Manzanita Place. Offering full-service in-house catering, full-service bar and kitchen including a friendly, experienced staff for all your event venue needs. For your seminar, wedding reception or reunion contact Manzanita Place 530 343-5617 http://www.manzanitaplacechico.com . Our Lodge facilities also include an outdoor picnic pavilion with bar-b-ques, volleyball, horseshoes and restroom facilities. 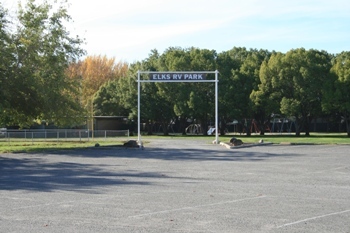 We have a 15 Space RV Park with hook-ups, space available for Elks Members Only. Plenty of on site parking for events.